Back in December of 2009 I had a chance to use and review the then new Specialized Command Post. This review is of the second generation of this product which is now called the Specialized Command Post BlackLite. My review was favourable and the Command Post has remained on my bike since the review. The only maintenance I’ve had to do is to put a bit more air in the post since it had lost some over time. It still functions perfectly. As with the previous version, the BlackLite Command Post is an air sprung, three-position on-the-fly, adjustable, telescoping seat post. The intent remains the same - to provide the ability on all-mountain and freeride bikes to raise and lower your seat post to suit the terrain, while riding. Command Posts found their way on to several Specialized models as standard equipment. 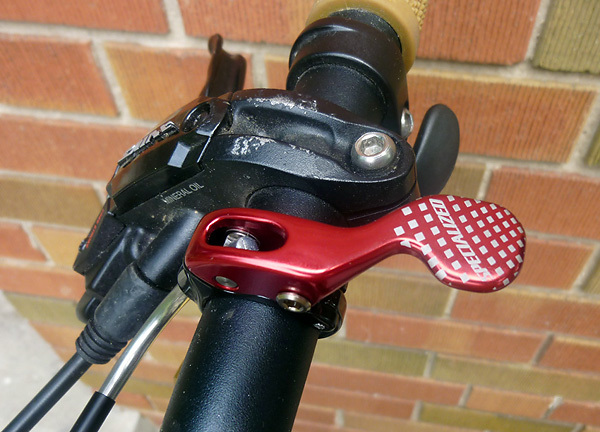 Look for it on most of the Enduro models and on a couple of the Stumpjumper FSR’s. Like the original, the BlackLite has an internal air spring which makes the post pop up. Your body weight makes it go down. There are three positions to suit the terrain. To drop the post you depress a small lever on the handlebar which unlocks the post from the position it is currently in. Our test BlackLite had the 125mm extension. The middle position was an 85mm extension and then, of course, there is zero extension. 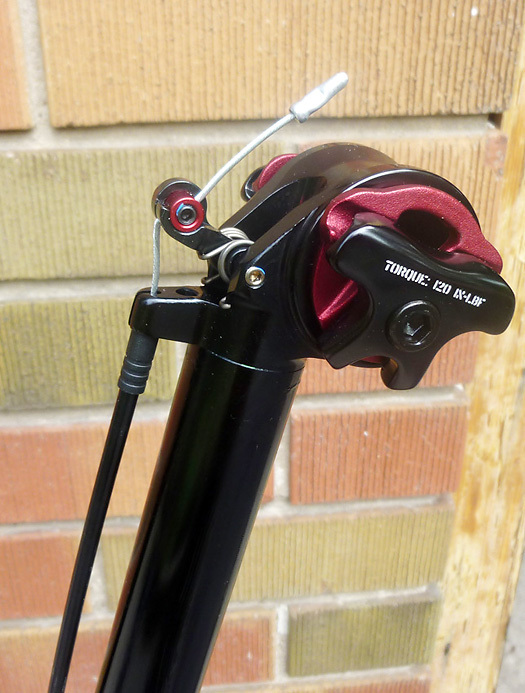 Total length of the post from the bottom to under the seat clamp was 390mm. A minimum insertion into the frame of 100mm is required. A gear cable and casing extends from the lever to the post (see photo below). Here there are some small differences between the original and the BlackLite. For the original the cable adjuster was mounted just under the seat post head. On the BlackLite it is positioned within the run of cable casing. I put it near the handlebar. The cable fixing bolt has also changed. Unlike the originals derailleur-like bolt, the new one has a small barrel with a fixing screw. It was a little fussier to set up than the original but I suspect it makes it easier to manufacture. The only other changes are a slightly different seat clamp and some flashier graphics. The main issue with my original review was that the Command Post only came in one diameter, which was 30.9mm. My problem was that both of my all mountain bikes use 31.6mm posts. A pop can shim was the only solution I could come up with and it was far from a perfect set up. That issue has been dealt with. Specialized now offers the BlackLite in both 30.9mm and 31.6mm diameters. That will open up this product to more cyclists. On top of that, there are now three different lengths. The original had 100mm and now you can also get 75 and 125mm lengths. That means that there are a lot more bikes that can use this product. As mentioned previously, our test post was the 125mm, 31.6mm size. However, there is still the whole issue of the weight. A penalty remains over a normal seatpost, but Specialized has trimmed the weight a bit. Specialized claims that the new version (sized at 100mm, 30.9mm) is 100 grams lighter than the original. The BlackLite I tested has a claimed weight of 541 grams with the remote. That’s still pretty heavy, but again it has to be taken into the context of the type of riding it was intended for. The BlackLite was most recently used on an IMBA Epic Ride along the Niagara Escarpment. To those who know the terrain it has lots of broken rock and ledges to go up and down. I used the BlackLite frequently and it always functioned well. There is one steep down over broken rock that typically stymies me on my XC bike, mainly because of the saddle height. Dropping the BlackLite took care of that since I could get that much further back over the rear wheel. I suspect as with the original Command Post the BlackLite will remain on this bike. Overall, the new Command Post BlackLite isn’t a whole lot different than the original and that is a good thing. As before it's finished well and it works well, and now it is also lighter. Suggested retail price is $350. Look for the Command Post at your local Specialized dealer. More info is at www.specialized.ca.